a book chick: "pride and prejudice"
my take: i've recently watched both newer versions of P&P ... and since i inordinately love the BBC production with Colin Firth and my BFF claims the Kiera Knightley production to be as good ... i decided to re-read P&P and discover which more closely portrays Jane's characters, dialog, setting, etc. and the BBC P&P takes much of its dialog directly from the book. where Jane occasionally just gives a vague description of part of a convo, BBC wonderfully fills in Jane-esque repartee. 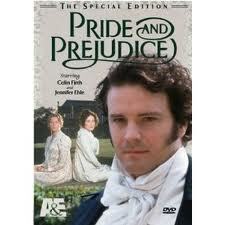 as wonderful as the BBC production is, it doesn't quite portray Lizzie's change of heart towards Mr. Darcy. and it ends before the book ends. give us more! otherwise, the production is faithful and divine. rare to say, but the book and movie are nearly equally as wonderful. a slight edge to the written word. 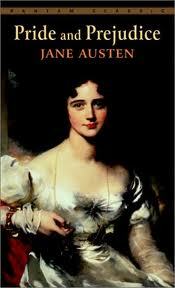 the Knightley version is earthy and mucky and i doubt Mr. Darcy would ever say, "i love, i love, i love you." and i am sure Mrs. Bennett's nerves would never do out in the pig pen. my source: i re-read my copy from the early 90's. what a treasure. yellowed pages and all.